William Chan (center) leads the Triad. The Skinny: This update of the triad genre is decently made but completely generic. One or two new twists are not enough to compensate for a whole that's so derivative and lacking in innovation. Entertaining and unremarkable. William Chan is young and dangerous but he’s not Chan Ho-Nam. The former Sun Boyz member takes his shot at the youth triad film, headlining EEG’s Triad, which arrived in theaters only months before Wong Jing’s Young and Dangerous reboot. Both films are directed by Daniel Chan (the unfortunate Cross), which means Chan is about to reboot a series that he clearly just aped. Triad packs a years-spanning triad saga into a brisk ninety minutes, using familiar concepts, familiar imagery and familiar themes to tell – guess what – a very familiar tale. Triad doesn’t reinvent the wheel and indeed seems to reuse old tires while polishing the existing rims. Poor metaphors aside, this is an unremarkable iteration of a well-worn yet still entertaining Hong Kong Cinema genre. Translation: it’s fine for what it is. 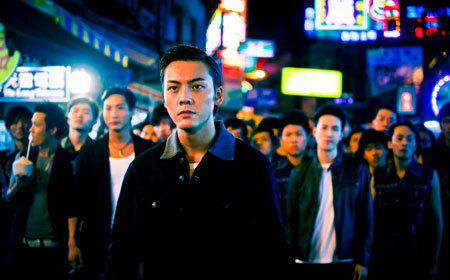 William Chan stars as William, a bookish Mongkok resident who decides to follow local boss Patrick (Patrick Tam), a member of the Heng Gang triad. Even though William has the tools to build a more respectable future, he appreciates Patrick’s kindness to his family, plus William’s pals Derek (Derek Tsang) and Edward (Edward Chui) are also in the gang. Ergo, William decides to follow a similar shady path, and soon he’s rising up the ranks, impressing people with his business smarts and his cool Chan Ho-Nam-like tattoo. Unfortunately, William’s moneymaking schemes interfere with the activities of Heng Gang boss Ming (Lam Lei), not to mention his wife Sister Irene (Irene Wan) and underling Kin (Deep Ng). With strife brewing within the gang, and his ambition thwarted by his supposed brothers and sisters, William must decide just how far he’s willing to go to succeed in the triad world. Triad delivers familiar trope after trope. Even though he’s a triad, William goes through bouts of self-loathing and resolves to be tougher and crueler, and yet he still finds himself torn between his triad ambitions and a future with his girlfriend Michelle (Michelle Wai). He spars with brothers, protects women, makes choices for justice and brotherhood, blah, blah, blah. Honor, betrayal, sacrifice, etc. – they’re pretty much all here. The film does rearrange some tropes and delivers a small subversive nudge at the end, but by and large this is old stuff. Triad shares much in common with triad film classics – from Election to Young and Dangerous to As Tears Go By – but it doesn’t really commit that strongly in any direction, making it only a superficial success. There’s meat here but it’s been separated from the bone and cut up into nice, bite-sized pieces. Tougher, more substantial films would require you to chew. The film’s status as a 2012 triad film does allow for some minor commentary. Hong Kong’s post-Handover changes factor in, from the numerous financial crises to urban redevelopment to evolving cultural values. These themes show potential, but Triad remains cursory and never looks that deeply. The most notable thing here may be that all the historical and social details are marked with Emperor Group businesses or landmarks (EEG has fingers in a lot of pies). Swearing and triad rituals earn the film a Category III rating and add a little authenticity, but that’s all it is: a little. The rituals include huge titles that practically announce, “Hey, this is legit!” while the swearing only applies to a few characters, most memorably Deep Ng’s entertainingly smarmy Kin. Acting is generally OK, with Patrick Tam impressing the most with a warm, shaded performance. In the lead, William Chan is solid if unremarkable.